We all know how to handle exception in java code. But if there are any exception occurred at client side jsp files then how we can handle? 1. By adding <error-page> element in web.xml for different error codes and exceptions. 2. By errorPage and isErrorPage attributes in page directives. First lets see simple example by adding <error-page> element in web.xml for handling error codes. 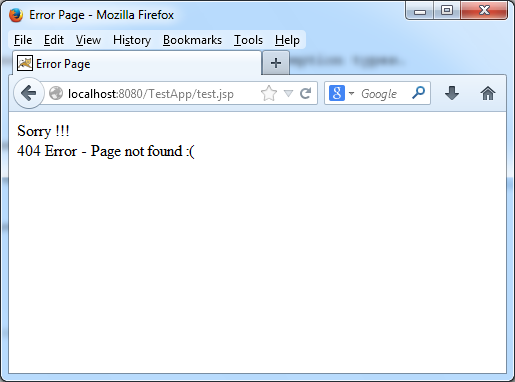 Here we have configured <error-page> elements for 404 error page and exception types. If user tries to open page which not found then automatically error404.jsp page will be called. We will try to access page which not present in the path like test.jsp. Next we will test for exceptions in Jsp file. expError.jsp file is a generic file to handle all types of run-time exceptions based on <exception-type> element in web.xml. Here we printing exception type and its stack trace. test_exception.jsp page will be used to test exceptions. 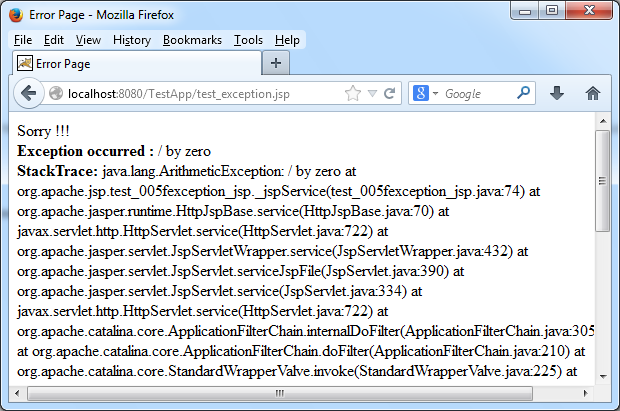 Here we are generating divide by Zero exception which will automatically thrown to expError.jsp page. 2nd type is by adding errorPage attribute of page directive in actual pages and isErrorPage attribute in error pages as like below. To test without web.xml, remove <error-page> elements from web.xml and just add <%@ page errorPage="expError.jsp" %> page directive in top of test_exception.jsp and test through browser which will redirect to expError.jsp page.